4 Why should you do an economics PhD? 5 What are the downsides of doing an economics PhD? 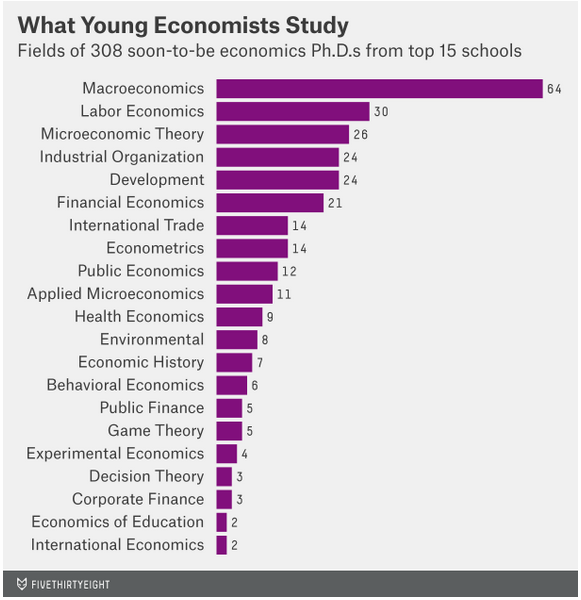 6 Who should consider doing an economics PhD? An economics PhD is one of the most attractive graduate programs: if you get through, you have a high chance of landing a good research job in academia or policy – promising areas for social impact – and you have back-up options in the corporate sector since the skills you learn are in-demand (unlike many PhD programs). You should especially consider an economics PhD if you want to go into research roles, are good at math (i.e. quant GRE score above 165) and have a proven interest in economics research. • Decent chance of entering economics academia, which has potential for highly valuable research and the option of working on topics in related social sciences. • In demand by think-tanks, government departments and international organisations (e.g. IMF, World Bank). • Gain a broad set of tools for understanding how the social world works and evaluating causes and interventions. • High degree of autonomy when writing your dissertation. • Backup options in the corporate sector. • Takes a long time (5-7 years), with low pay. • Doing highly open-ended research provides little feedback which can be unmotivating. Strong math skills (i.e. 165+ on quant GRE), want to enter high-level research roles, prepared to work long hours. You can test your ability and interest by taking classes in economics, math and statistics either at your university or online. You don’t need an economics undergraduate degree to enter but proven math ability is required, so make sure you study quantitative subjects. See this guide to getting into an economics PhD program. For this profile, we interviewed economist Robin Hanson and read the following sources. See all our research in our wiki. In this profile we focus on doing an Economics PhD in the US, which usually takes 5-7 years.1 In the first two years you take classes and the remaining time is spent on writing a dissertation. You usually have to teach during your PhD. More detail on what you do in each phase is here. At the end, you usually apply for jobs through the centrally organised Job Openings for Economists, which is run by the American Economic Association, or you can apply for jobs independently. Specialisation of final year PhD students in 2014. Source FiveThirtyEight. An economics major isn’t required but you need proven math ability and it helps to have taken mathematical economics classes. Excellent letters of recommendation from academics; ideally, those that are well-known. Can you enter from a non-quantitative background? It’s possible, but difficult. You’ll need to spend one to three years retraining. See some advice on how to meet the entry requirements if you have a non-quantitative undergraduate degree. Why should you do an economics PhD? You are nearly guaranteed a job. The unemployment rate for economics PhD’s is very low (0.8% in 2013) and data indicates that it has the lowest unemployment rate of all science and engineering PhD’s.4 You also get the benefit of the centrally organised Job Openings for Economists, which allows you to apply to many different jobs in a short period of time and interview for them at the same time, in the same place. You can do research on high priority cause areas, like ending extreme poverty (see e.g. MITs Poverty Action Lab) or cause prioritisation (e.g. in support of the work of the Copenhagen Consensus). The impact you can have in these jobs tends to be more direct and focused on specific issues than in academia. Many of these jobs are advertised on the Job Openings for Economists, which means you don’t have to apply for them separately from academic jobs, as is the case for other PhD’s. Moreover, the jobs outside of academia which economics PhD’s get are higher paid than non-academic jobs other PhD’s get.9 Overall, an economics PhD provides a very solid safety net if you don’t get a job in academia – you can get well-paid jobs in which you use your training. Having an economics PhD also puts you in a position to build a public platform and become a public intellectual through journalism and writing books. You can also influence policy through your research, though some claim that most of the time economists just provide arguments for people with pre-existing views. However there could be room for outsized influence if you provide policy recommendations on issues that are orthogonal to popular disputes,10 and our guess is that in the long-run economists can change conventional wisdom about what is good policy. You often get a high degree of autonomy with your dissertation and aren’t forced to specialise narrowly in your advisor’s research interests, giving you freedom to pursue research topics that you most want to work on (though we’ve heard that sometimes there is pressure to choose topics with higher publication and job market value). You gain a broad set of tools for understanding how the social world works, which is helpful for evaluating causes and interventions. This may help you better evaluate your future career options to have more impact. A notable example of this in action is the founding of GiveDirectly (one of GiveWell’s top recommended charities), which was founded by economics PhD students. What are the downsides of doing an economics PhD? You have a relatively low income whilst doing your PhD and have to work very long hours. You spend 5-7 years getting exposure only to academia, making this option less good for exploration value. The high degree of autonomy you get means there is little external structure on your time, which can be stressful, and you get very little feedback about how well you are doing which can be demotivating. Who should consider doing an economics PhD? If you meet those conditions, then an economics PhD may be a good option for you if you want to go into economics academia or if you want to do high-level research at think-tanks or international organisations. To get a sense of what academic research looks like, try reading published papers in major journals, such as the American Economic Review (here is one paper). You can then test your ability and interest by taking classes in economics, math and statistics either at your university or online. There are many guides online to getting into an economics PhD. We recommend that you start by reading this one, and then read a few of the others. If you’re applying from a non-quantitative background, see these tips by one of our users. Podcast: Prof Yew-Kwang Ng is a visionary economist who anticipated many key ideas in effective altruism decades ago. Here’s his take on ethics and how to create a much happier world.